The Arabidopsis Interactions Viewer queries a database of 70,944 predicted and 36352 confirmed Arabidopsis interacting proteins. We have also included 2.8 million experimentally determined protein-DNA interactions. The predicted interactions (interologs) were generated by Drs Matt Geisler and Jane Geisler-Lee at the Southern Illinois University (Geisler-Lee et al., 2007). Their current version is Interactome 2.0. The confirmed Arabidopsis interacting proteins come from BioGRID (Chatr-aryamontri et al. 2017), BIND - the Biomolecular Interaction Network Database, from high-density Arabidopsis protein microarrays (Popescu et al., 2007; Popescu et al., 2009), from Braun et al. 's Arabidopsis Interactome 2011 , from Wolf Frommer's Membrane protein INteractome Database MIND, and over 1,190 other literature sources. The protein-protein interactions in these sources were identified using several different methods, such as yeast two hybrid screens, but also via traditional biochemical methods. Use the links in the reference column that are in the tabular output of this viewer to view further information, or mouse-over the edges. The DNA-protein data were generously provided by O'Malley et al. (2016), Gaudinier et al. (2011), Taylor-Teeples et al. (2015), Li et al. (2014), and Brady et al. (2011) and were mostly generated by DAP-seq, with some generated by Y1H. All subcellular localisation data is from SUBA, the Arabidopsis Subcellular Database (Hooper et al., 2017). 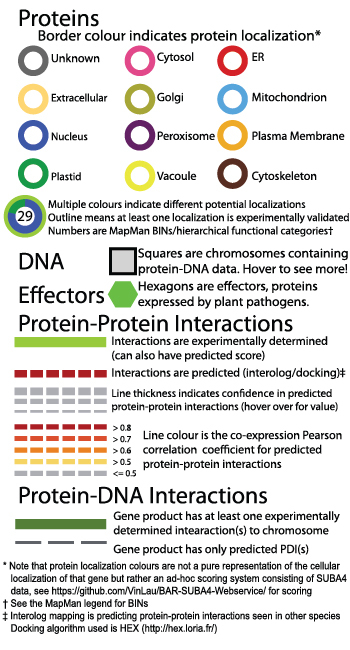 Additional protein function data is from MapMan (Usadel et al., 2009). Designed and Developed by Vincent Lau with design consultation from Dr. Nicholas Provart. Built with CytoscapeJS, thanks to Max Franz and Asher Pasha for development advice. Funding provided by Genome Canada and NSERC. Upload an exported AIV2 cytoscape JSON or your own protein-protein interaction data. For uploading your own data, see the below JSON structure and use the same property names. Also preappend nodes with 'Protein_' in 'id'. The app will then overlay your network with extras such as localization data. Some features are disabled when uploading such as the table view and DNA tooltips.